609. Lin Hua-bao and Min Gui-rong, "The Chinese Recoverable Satellite Program", Paper IAF-89-426, 40th Congress of the International Astronautical Federation, October 1989. A general reference was made in a 1989 scientific paper about the development of a second generation of recoverable satellites which would be "much larger, heavier, and more advanced than FSW-2" (Reference 609). The new spacecraft would also incorporate more sophisticated reentry lift techniques to improve landing precision and to lessen deceleration forces, which are currently as high as 20 g's for FSW capsules. No subsequent discussion of this proposed satellite has ensued. China's third generation of imaging satellite, the FSW-3, was expected to be a recoverable system with better than one meter resolution. The FSW-3 1 [(FSW 18] "science experimental" satellite China put into orbit on 03 November 2003 atop a Long March 2D carrier rocket was launched from a newly-built launchtower at Jiuquan Satellite Launch Center in Gansu Province, northwest China. With a lift-off mass of 251 tons, the launch vehicle, 40.6 meters in length, was developed by the Shanghai Academy of Space Technology with China Aerospace Science and Technology Corp. The launch was the 73rd by the country's Long March carrier rockets since 1970, and the 31st consecutive successful launch since October 1996. 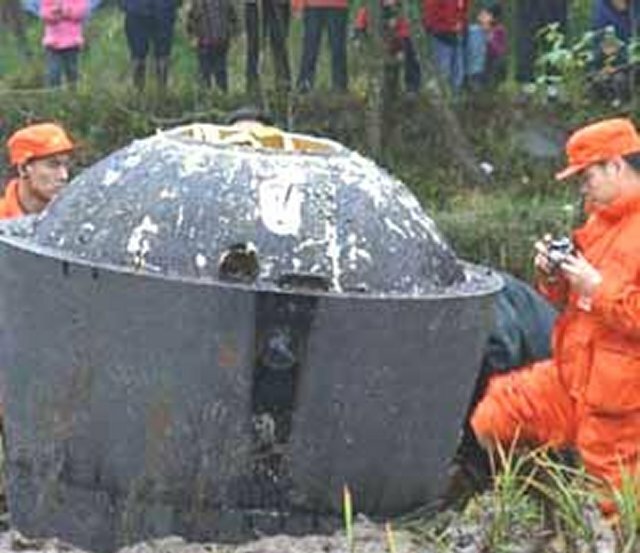 It returned to earth and landed in Sichuan Province, southwest China, at 10:04 AM (Beijing time) on 21 November 2003. The satellite was the 18th recoverable satellite China has developed, and was described as being technically much more advanced than the previous ones in terms of performance. The satellite was mainly for scientific research, land surveying,mapping and other scientific experiments, said the experts. The data China gathered will help promote the country's scientific and technological, economic and social developments. Also designated Jianbing-4A1, FSW-18 was known as the Seed Satellite. FSW-3 2 [2004-033A] was a recoverable imaging satellite that was launched by a Long March 2C rocket from Jiuquan Satellite Launch Center in Gansu province in north-western China at 07:50 UT on 29 August 2004. Also designated Jianbing-4B 1, It was the 19th launch of such recoverable satellites. It will provide mapping and land surveying data. The initial orbital parameters were period 91 min, apogee 553 km, perigee 168 km, and inclination 63°. After a mission of 26.67 days, it successfully re-entered and recovered at 23:55 GMT on 24 September 2004. This spacecraft was said to have improved experimental technology, with higher orientation precision and more complex on-board computers and software. FSW 3 3 [FSW 22] [2004-039A] was a recoverable, photo-imaging spacecraft that was launched by a Long March 2D rocket from Jiuquan Satellite Launch Center in Gansu province in northwest China at 08:00 UT on 27 September 2004. It was reported that the satellite, designated Jianbing-4A 2, will be "used in scientific research, geological surveying, and mapping". This was the 20th launch of such recoverable satellites. After a flight of 17.78 days, it returned to Earth at 02:48 GMT on October 15, falling through the roof of a house in the village of Penglai, Sichuan province. The FSW-4 (Fanhui Shi Weixing) or JB-4 series was the final series of Chinese recoverable satellites. This series was unique in all FSW missions, as it used a shrouded CZ-2C (3) launch vehicle, instead of the aerodynamically shaped satellite being launched unshrouded. Possibly the launch vehicle was left over from the Iridium launch program. FSW 21 [2005-027A] also known as FSW-3 4, was a Chinese recoverable satellite that was launched by a Long March 2C rocket from Jiuquan Launch Center in northwest China at 07:30 UT on 02 August 2005. It will conduct "scientific research, land surveying and mapping". The initial orbital parameters were period 91.7 min, apogee 547 km, perigee 169 km, and inclination 63°. FSW 22 [2005-033A], also known as FSW-3 5, was a recoverable satellite that was launched by a Long March 2-4 from Jiuquan Launch Center in northwestern China on 29 August 2005. "It will carry out scientific research, land surveying, mapping and space-technological tests." The initial orbital parameters were period 89.3 min, apogee 264 km, perigee 178 km, and inclination 64.8°. With this second pair of launches, the FSW recoverable imagery intelligence spacecraft program, which had seemed moribund a decade earlier, had been revived with a vigor it never enjoyed in the 20th Century. Rather than a single launch every year or two, the program seems to have established a pattern of a pair of launches in the August-September timeframe. The spacecraft are apparently not identical, since one was designated Jianbing-4A and the other Jianbing-4B, though the nature of the differences was completely opaque. In fact, these were the last launches of the FSW program, which was soon followed by the the Yaogan Weixing [Remote Sensing Satellite] radar and electro-optical satellites.